A very special gift for a very special person. Create an arrangement that is indeed the essence of enchanted love. 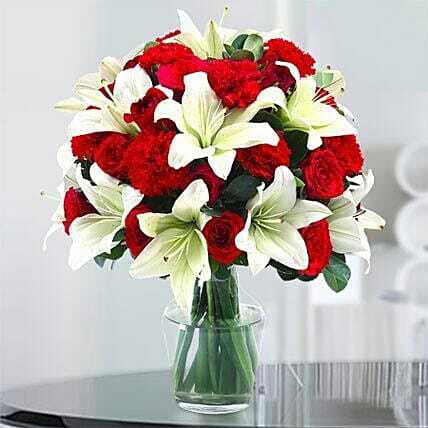 This flower arrangement brings together lovely red roses, carnation and white asiatic lilies in a clear glass vase. Simple yet elegant, this flower arrangement is a fabulous gift. This bouquet which is blooming with romance and sweet affection, sends your warmest sentiments with glamour and grace. Love planted a rose, and the world turned sweet. Katharine Lee Bates Meaning of flowers: Red roses are the symbol of passionate love, red carnations are the symbol of love and affection and white lilies symbolize chastity and virtue.